Saturday morning at 7:00, the Falcon GT slipped the lines and headed out of Bronte Harbour towards Port Credit Yacht Club for the start of the Ontario 300. The weather was calm, mist rising off the still water and fog shrouding the shore. We had to motor. Anticipation was high amongst the crew*, but the lack of wind was a concern. We arrived outside of PCYC around 9:00 am and dropped anchor, waiting for the start of the race. There were around 130 boats, in various classes, taking part in the regatta. We were in the fully crewed spinnaker division 2 along with 10 other boats. At 10:55 am, with a downwind start we pulled up the spinnaker and raced towards the first mark at Gibraltar Point off the Toronto Islands. 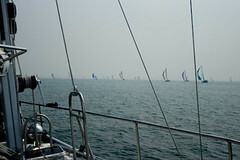 It was quite the sight to see all the boats flying their spinnakers around us. However, the winds slowly started to die and become variable. Early in the evening, a thunderstorm rolled in with heavy rains but it cleared rewarding us with a brilliant rainbow and sunset. As night fell we continued to fly the chute, but the winds became increasingly fickle. In the darkness the fleet started to spread out, each charting their separate course searching for the wind. Stuart and I had first watch and, during the night, we played cat and mouse with other boats around us. A breeze would pick up filling our spinnaker and we would skim past the competition. Then it would die collapsing our kite and allowing the other yachts to slide ahead. And so it went as the darkness drifted on. At 1:00 am Sunday, John and Doug took over and we went below to sleep. Some time that morning, perhaps 2:00 am, I heard the rain return. At day break we were alone having tacked out into the lake. The rain continued but the wind was gone except for light whispers. We struggled to make way and from 1:33 pm to 5:25 pm made only about 5.5 nautical miles. 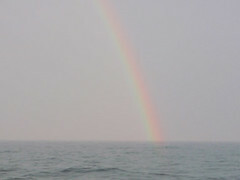 During that time, we had only rare sighting of other boats – our competition? We did not know. Sunday, 5:25 pm our position was 43° 47.727′ N by 78° 00.425′ W and speed over ground at a neck breaking 0.0 knots. There was absolutely no wind. A bored Thomas took a swim while his old man slept. Still waiting for a current of air, at 7:00 pm we had lasagna while watching Donnie Brasco starring Al Pacino and Johnny Depp – I highly recommend it. After the movie, John called a crew meeting to consider whether we go on or withdraw. We had hoped for strong winds to push the boat and us. Since we had not gotten that and the forecast was for continued variable winds, we abandoned the race. So on July 20th at 8:30 pm we turned on the engine and headed home. In the waning hours of our sail, as we approached Bronte Harbour, the Coast Guard sent out a storm-warning broadcast for severe thunderstorms with potential of waterspouts. Around us, the breeze picked up to gale force. The birds fought the wind making no headway, the boat bucked at the chance to go but it was too late for us and we headed into the harbour, our race done. But the race and sail was not a waste. 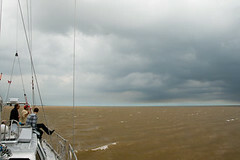 We gained more experience on the boat and it was the first time we had sailed with a full crew. 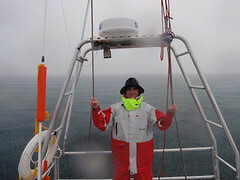 The continued rain stressed the importance of keeping the inside of the boat dry at all costs. We discovered a few new minor issues that need to be worked on. In addition, for me, it reinforced the fact that my photography and computer equipment must be stored in watertight cases. Therefore, while we did not get the weather or the glory we wanted the race was well worth it. It has been two days since I got home from sailing in the Ontario 300. Since then I have been suffering from post adventure depression and have been lounging around. So today I decided to go and get some electrotherapy by riding my bike in a thunder storm – actually it was not raining when I left. Any way, Mother Nature protects little children, fools and grown boys who venture out in thunder storms. Within minutes of leaving it started to rain but I continued. By the time I was 5 km out the thunder and lighting started but I continued. At 10 km out the thunder and lighting were going off together right above me – thankfully I had my bowel movement earlier in the morning…. I this point I had turn back home. I decided to continue riding instead of seeking shelter for two reasons. One, I figured that the small surface area my rubber bike tires made to the ground reduced me as a target and two I was riding next to hydro towers which should make a better target then I. As I write this the sun is shining now the sky is blue – timing is everything. Anyway I will be posting a summary of our adventure in the Ontario 300 over the next few days along with some pictures. It has been a long day getting the preparations done for the race tomorrow. All is done and it is late. I have to get up tomorrow morning at 5:00 am and be at the boat at 6:30 am. We are taking the boat to PCYC from Bronte and have to be there before the first start at 10:30. To pick our boat go to the boat selector and pick spinnaker FC2 and you will see Falcon GT. Once the race is done I will post pictures and give a summary on how things have gone. 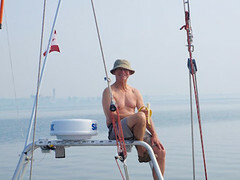 As part of our preparation for the major voyage, we have entered the Lake Ontario 300 race (http://www.lo300.org/index.php). 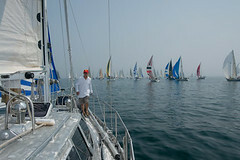 The event starts Saturday, July 19 off Port Credit Yacht Club. The spinnaker fleet will sail a 300 nautical mile clockwise circumnavigation of the lake, starting at Port Credit, then on to Gibraltar Point/Toronto, Whitby, Main Duck and Yorkshire Islands, Ford Shoal, Niagara, Oakville, and finish at Port Credit (http://www.lo300.org/web_images/2008_courses_spin_large.gif). Stay tuned for more on this….